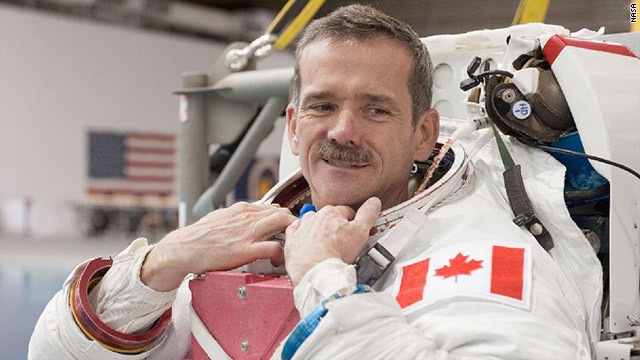 Canadian astronaut Chris Hadfield recorded a tune in space. We've been catching up on space news after the holidays. Here's a roundup of some of the best stories. It turns out the Earth and Sun have something in common: They both celebrate New Year’s Eve with fireworks. Our closest star welcomed the new year with remarkable fireworks during a four-hour flare eruption. A video from NASA’s Solar Dynamics Observatory displayed "a bright plume of super-magnetic plasma that exploded from the sun’s surface on New Year’s Eve," Space.com reported. The observatory is designed to monitor and record solar flares and other activities that involve the sun and the weather. The sun has an 11-year weather cycle, and astronomers expect the sun’s activity to reach its highest peak in 2013. NASA's Curiosity rover, with its mast-mounted cameras and laser, spent the holiday season studying Martian terrain at "Grandma's House," a nickname given to a region inside Yellowknife Bay, which is a half-meter-deep basin at the Gale Crater landing site. Scientists explored the new area of the Red Planet containing terrain that was not revealed in previous observations on Mars. In order to get a clearer image of the bay's interior, NASA researchers used the rover to record a 360-degree panoramic view, reports Space.com. Curiosity is focused on choosing a suitable rock it can drill to produce a powdery rock sample, which can be gathered for a drilling test in early 2013. Canadian veteran astronaut Chris Hadfield, aboard the International Space Station, recorded his first original holiday music a couple of days before Christmas. The 53-year-old avid guitar player performed Christmas carols with some of his crewmates, including NASA astronaut Tom Marshburn and Russian cosmonaut Roman Romanenko while living in orbit. Hadfield, the first Canadian to do a space walk, posted the new song titled "Jewel in the Night" online, marking a milestone in space. Hadfield is a flight engineer on the Expedition 34 crew and will command the in-orbit laboratory on Expedition 35 in early 2013, which will make him the first Canadian space station commander. NASA released two new eBooks on the Hubble Space Telescope and the James Webb Space Telescope during the holidays to help readers explore images and learn more about the science and technology used in developing the two space observatories. The eBooks contain a compilation of discoveries by the two telescopes. The Webb Space Telescope is three times larger than Hubble and can detect new stars and galaxies in infrared wavelengths in distant space. The Hubble Space Telescope will be replaced by the Webb Space Telescope. It has provided scientists with high quality detailed images since 1990.